I already wrote how I build a magic SET hypercube with my students. Every time I do it, I can always come up with a new question for my students. This time I decided to flip over two random cards, as in the picture. My students already know that any two cards can be completed to a set. 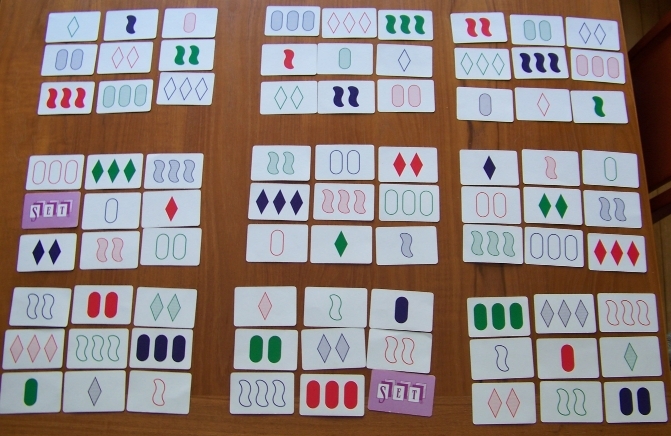 The goal of this activity is to find the third card in the set without trying to figure out what the flipped-over cards are. Where is the third card in the hypercube? Sometimes my students figure this out without having an explicit rule. Somehow they intuit it before they know it. But after several tries, they discover the rule. What is the rule? Another set of questions that I ask my students is related to magic SET squares that are formed by 3 by 3 regions in the hypercube. By definition, each magic SET square has every row, column, and diagonal as a set. But there are four more sets inside a magic SET square. We can call them super and sub-diagonal (anti-diagonal) wrap-arounds. Can you prove that every magic SET square has to have these extra four sets? In addition, can you prove that a magic SET square is always uniquely defined by any three cards that do not form a set, and which are put into places that are not supposed to from a set? Thanks. I saw the paper.